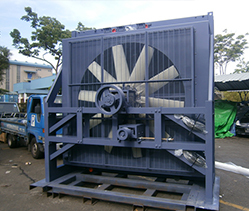 Pulley Driven Radiator | Perfex International Pte Ltd - Radiators, Charged Air Coolers, Heat Exchangers and Oil Coolers for power generation and other industries. Mounted on the same skid as the engine, the radiator utilizes a pulley to regulate the degree of which the fan is engaged, hence the cooling factor and temperature. When the engine is cool or at normal operating temperatures, the fan clutch partially disengages the engine’s radiator cooling fan, that is driven by a belt and pulley connected to the engine’s crankshaft. This saves power since the engine does not have to fully drive the fan. However, if engine temperature rises above the clutch’s engagement temperature setting, the fan becomes fully engaged, thus drawing a higher volume of ambient air, which in turn serves to maintain or lower the engine coolant temperature to an acceptable level. Suitable for Mitsubishi, Caterpillar, Waukesha, Wartsila, MTU, MAN Diesel and other diesel or gas engines.